The road accident in Khulna that killed five passengers of a private car occurred when the driver swerved out of the way of a man with a disability only to ram a truck, police say, reports bdnews24.com. 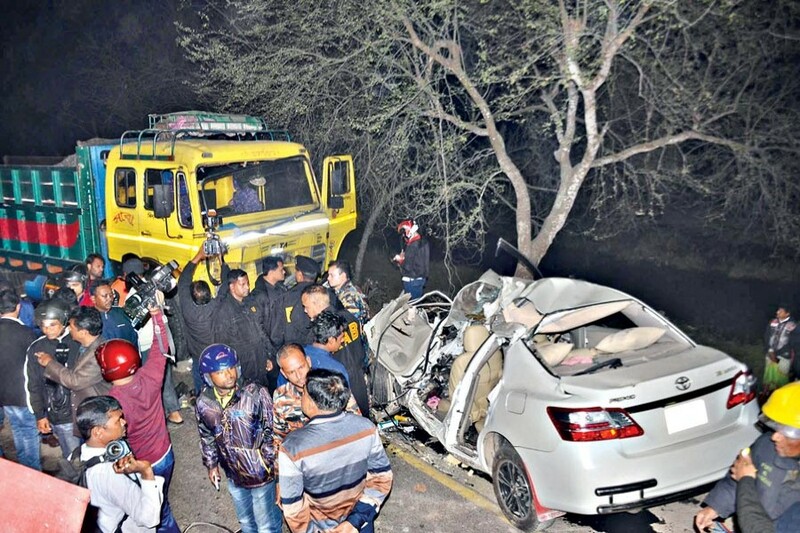 The accident took place at Khejur Bagan near the by-pass road of the Rupsha Bridge on Sunday night, killing four leaders of the Gopalganj district wing of Chhatra League and one from Jubo League. The dead were identified as Mahbub Hasan Babu, organising secretary of Gopalganj district wing of Chhatra League, Sadikul Alam, vice president in Gopalganj central wing of Jubo League, Walid Mahmud Utshob, deputy secretary of district wing of Chhatra League, Shaju Ahmed, deputy secretary of district wing of Chhatra League and Aminul Islam Gazi, member of the district wing of Chhatra League. All of them, except Sadikul, were students of Gopalganj Government Bangabandhu University College, said police. The victims were friends and used to hang out together, said Md Shafiqul Islam, chief of Lobonchara Police Station. They drove a private car to Khulna on Sunday. Sadikul was at the wheel on way back to Gopalganj from Zero Point in Khulna. 'A vagabond with a mental disability' thrust himself in front of the car as it was crossing Khejur Bagan, said the OC. "The driver rammed the car into a Zero Point bound truck coming from the opposite direction in a bid to save the man." The fire men recovered the body of five people with the help of the locals and police from the private car, said the OC. Police seized the truck, but the driver fled along with his helper. The families of the dead, along with their friends and neighbours, were in shock when the bodies reached their residences in Gopalganj on Monday morning. People across Gopalganj expressed their grief over the incident. The dead will be laid to rest following funeral prayers at the Sheikh Fazlul Haque Moni Stadium.